Phoebe Russell will perform with the Canberra Symphony Orchestra on 2 and 3 May. Photo: Supplied. Phoebe Russell wanted to play the harp as a child but had to settle for something far more earthly. The double bass virtuoso has still managed to play like an angel, and will delight Canberra audiences this week (2 and 3 May) when she performs with the Canberra Symphony Orchestra in its second ActewAGL Llewellyn series concert at Llewellyn Hall. The CSO, under German conductor Johannes Fritzch for the first time, will celebrate composers old and new, with Russell featuring in Jan Krtitel Vanhal’s unusual yet entertaining double bass concerto. by Thomas Tallis), as well as Australian composer Paul Stanhope’s Morning Star, a personal response to the rich tradition of Indigenous music making in central Arnhem Land. Twenty-four-year-old Russell returned home to Australia in early 2017 after seven years in Berlin to take up the position of principal double bass with the Queensland Symphony Orchestra. CSO Chief Conductor and Artistic Director Nicholas Milton said Russell was now considered one of the greatest double bass virtuosos Australia had ever produced. As a young student in Melbourne, Russell had wanted to play the harp but instead she was offered the double bass because it was similar in size, but of course a very different instrument altogether. In fact, the instrument she will play at Llewellyn Hall in its first outing won’t be the double bass people will be expecting, being smaller with quite a bright sound like a cello. Dating back to 1700, the instrument belonged to one of her teachers who was principal double bass in Berlin Philharmonic and had a big solo career in Europe and Japan. “It has violin corners like a cello, the body is quite small so it’s a really powerful sound, really bright and loud,” she said. Power, a word that recurs in our conversation, is one of the attractions of the double bass for Russell. “It’s a very powerful feeling playing an instrument like this,” she said. Russell loves its depth of sound, rich tone and its sheer physicality. “The thing I really love about playing a double bass, especially mine, is it’s such a vibrant instrument and has such a rich sound that I really enjoy playing without shoes on because you get this vibration in the floor. It’s a great feeling,” she said. Russell said concert goers could expect an elegant piece of music that was very beautifully written, very classical in style, with very virtuosic cadenzas that really showed off the instrument. “Vanhal is like our Mozart, if only we had one,” she said. While it will be Russell’s first performance with the CSO, she is no stranger to Canberra, having attended a national music camp as a teenager with the CSO’s Max McBride – a huge figure in the double bass world – as a mentor. She also performed with the Australian Youth Orchestra at Llewellyn Hall a decade ago. Russell will also perform a recital at Wesley Music Centre on Sunday 29 April at 3 pm, playing Bottesini’s Introduzione e Bolero, Brahms’ Cello Sonata No. 1 in E minor, op. 38, and Gliere’s Intermezzo and Tarantella. She will play the Brahms on the double bass. “It’s easy, but it works really well because it plays a lot on the lower notes. I think it sounds really beautiful on the double bass but it’s difficult,” Russell said. Russell is excited to see so much young interest in the double bass, which seems to be enjoying a revival. “The standard of bass playing in Australia is phenomenal and people coming to audition the double bass have particularly improved in standard. 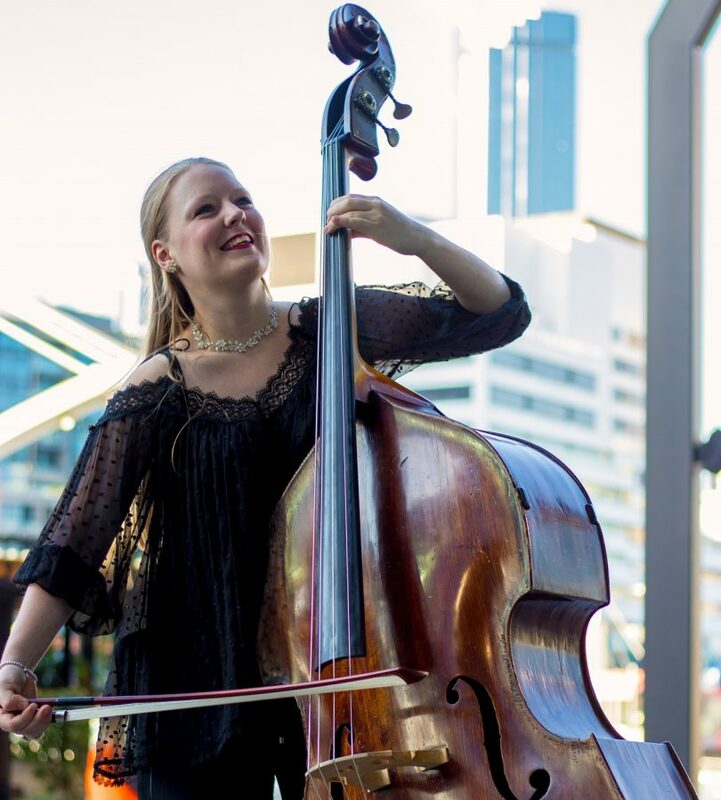 There are some amazing young double bassists around Australia,” she said. Russell welcomes having the spotlight on her, such as in this week’s performances with the CSO. “Double bassists are almost always accompanying other instruments playing melodies and as nice as that is, it’s a lot of fun when the roles are reversed!” she said. It will be interesting to see if she is wearing shoes. For more information and to purchase your ticket, visit cso.org.au or call CSO Direct on 6262 6772.